You've probably seen these hashtags (and more) floating around the Twitterverse. A chat for YA writers, a chat for indie writers, a chat for writers who wear sweatsocks on Tuesdays--but what's the point? Should you bother joining one? 10. Human interaction from the comfort of your own home. Go ahead and wear that Snuggie. We’ll never know. 9. No one smells. Thank you, Internet! 8. The sense of camaraderie you'll feel. These people get it! 7. You can have cookies. Or wine. Your call. 6. You just might gain a few friends/followers by the end of the hour. 5. You can contribute your own experiences/insights. 4. In turn, you might learn something new. Most of these chats have pre-announced themes to keep things fresh. 3. Want to stay up-to-date on your genre/category? Current events are always tossed around. 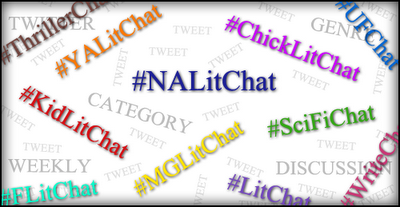 And while we're on the topic of Twitter chats, I want to throw out a quick plug for #NALitChat (new adult). We've only had two weeks so far, but it's trended both times. Encouraging, I say! Join EJ Wesley (and a handful of gals from NA Alley) every Thursday night at 9:00 p.m. EST. 1. Trending based on Twitter’s new algorithm. I've only participated in one Twitter chat - need to do more. I've only done one, but now that I think back, it had all of those benefits you listed. I need to do more. I guess this is one of those advantages of Twiiter. I definitely see your point. Only wish I had the time to add yet another task to my day. I do like the networking aspect of it. I still have no idea how these work. What happens? I mean if I hashtag something, it's not like I'm notified when someone else tweets with the same hashtag. Is this one of those things where you have to sit in front of your computer with Twitter open and wait for tweets to come up? I don't understand. Ugh. Twitter. I know people swear by it but it seems like a great unknowable concept to me. 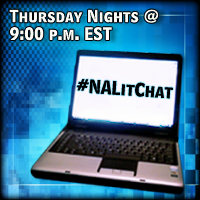 Twitter chats are the best and we do have so much fun during #nalitchat! The people chatting are so intelligent and the view points are refreshing, and the questions are curious & insightful. I am surprised (in a good way!) each week! Did you hear that, everyone? Iain is going to get a Twitter account! I have to confess, I don't like chat. I only use Facebook video so I can talk to my son face to face and see my darling little man Blake. But otherwise I like good ole email. Okay, I don't mind FB chat once in awhile as long as it's a quick chat, nothing mindboogling. Why? Okay, if you must know, my brain's old. It needs time to formulate it's thoughts. My fingers can keep up, but after a time even they're thinking, What the heck are you talking about??? I think your a maverick, Carrie. Things, chats, are only going to get better with you involved. Exactly! Who could argue with cookies and wine? ;) Thanks for stopping by, Meredith! Sounds like a reason to do another tutorial! :D Thanks, Leigh! I can usually be seen frequenting the #Writersroad chat on Monday nights at 9pm EST. They are a lot of fun and each week have a different topic about the writing journey. I really do need to join one. I just haven't taken the plunge yet. Thanks for the info! I hope you give it a try sometime. :) Thanks, Empress King! You promised you wouldn't tell anyone about the Snuggie! Hah! I just spit my water out. That was hilarious. Aww, man. These time zone differences are such a bummer! I'm sneaky like that. ;) Woohoo! I hope so, too. :) Good luck, Michael! I love TwitChats! The only issue for me is that they're often WAY past my bedtime, since the UK is anywhere form 5-8 hours ahead of USA! Great idea! Is it okay to post the NALitChat badge on my blog side bar? Since my books are new adult, I need to join in that chat sometimes. Absolutely, Natasha! I made it. :) Thank you! I have yet to write a Twitter chat, but its on my To Do List. Looks like a great way to meet new people too. You should, Stephen! It's an excellent way to meet new people. :) Thanks for stopping by! Wow, too funny, I was on Twitter when E.J. started his chat today - but I really didn't know what he was up to. That sounds like SO MUCH FUN! I'm going to have to hang out with you guys sometime soon!